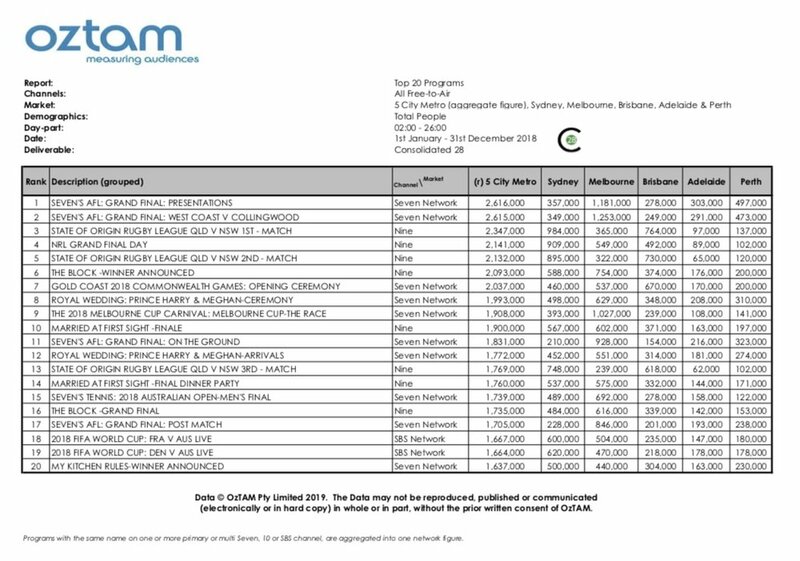 The Seven Network is 2018’s official winner according to the final ratings tally supplied by OzTam. The figures include +28 results and are the final say on where everyone has landed. Although, interestingly, the results are based on a calendar year and not the survey period. When TV Blackbox asked whether there would be an additional report for the 2018 survey period (i.e. the 40 weeks of ‘official’ ratings), we were told OzTam only report the calendar year as they supply ratings every day. It does beg the question why we have an official survey period. Anyway, the Seven Network can officially pop the champagne this morning as they have won overall network share with 30.6% and 7 was the #1 primary channel with 20.6%. Nine sat in second place in both categories and 10 was third, only just edging out the ABC by .4% in network share.. Sport dominated the top 20 programs of the year with Seven’s AFL Grand Final coverage taking out top spot with 2.6 million viewers. Nine’s State of Origin had 2.3 million. The top entertainment show was The Block - Winner Announced. Nine had an audience of 2.1 million for the big announcement which was coded separately from the final episode. Married At First Sight wasn’t far behind on 1.9 million but My Kitchen Rules only achieved a high of 1.6 million for its winner announcement. Peppa Pig was the biggest non-sport program on the FTA Multi Channel rankings with 281,000. It came in at #12 behind a variety of sport on 7mate. Over on Foxtel it was all sport, sport, sport on the top 20. AFL once again proved most popular with a Richmond v Collingwood match drawing 552,000 viewers. 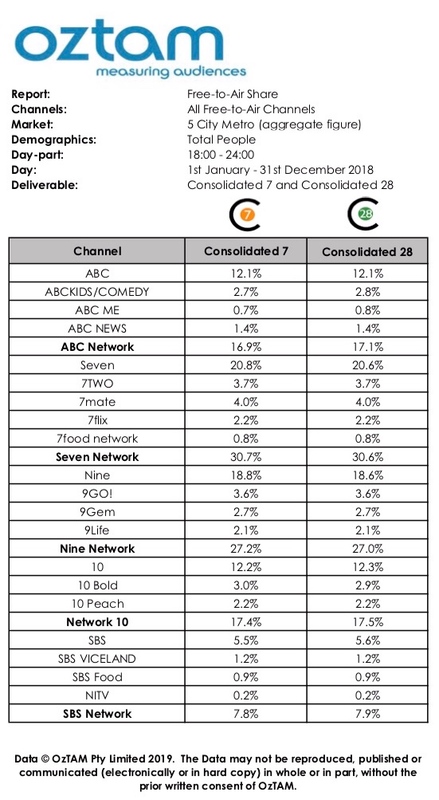 In 2018 the Seven Network proved it was #1 in every category, also taking out the Most Time Shifted category. The Good Doctor increased its audience in +28 figures by 358,000 and took the top 3 positions. Seven took out an impressive 11 spots in the top 20.